It 6am Saturday morning. I arrived at Cindy and Ed’s place with the rental car. With our internal frame backpacks all packed and ready to go, the car was fully loaded. 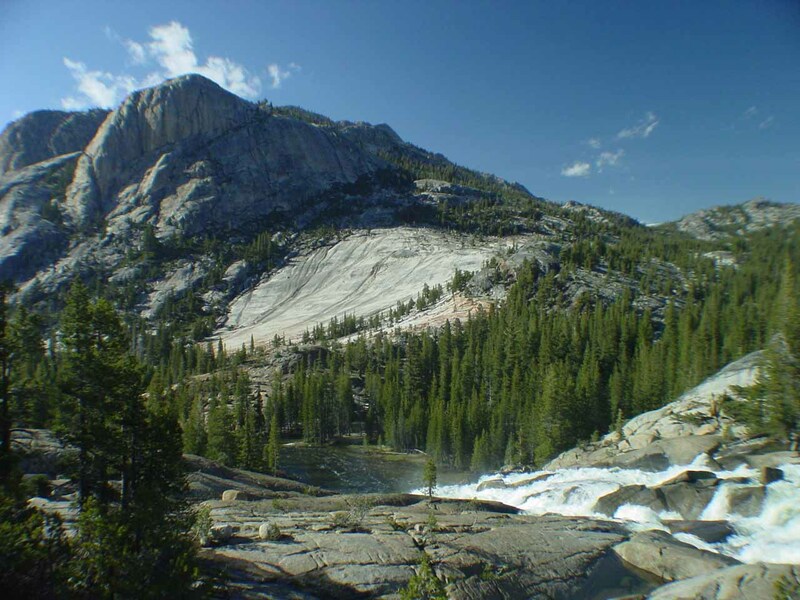 It was time to make the 5.5-hour journey up the Hwy 395 to the Tioga Pass Entrance of Yosemite National Park. I had arranged for pickup of our backcountry permits the previous night to ensure we’d have them if we showed up after 10am – which was the time they’d assume no-shows weren’t going to show up and surrender their permits to the public. 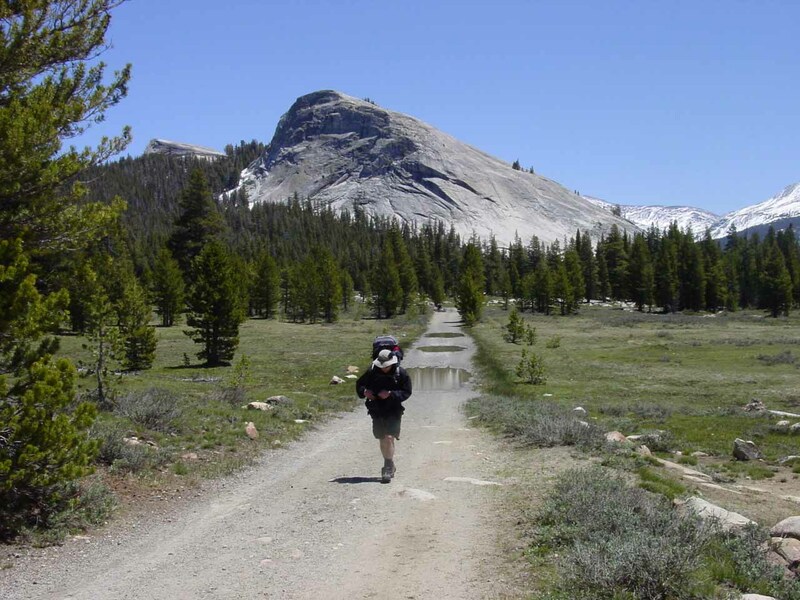 With our early start, we made pretty decent time getting through the Tioga Pass Entrance and then the backcountry office near Tuolumne Meadows. It was about 10:15am – a little after the deadline, but we didn’t sweat it because we had the permit arrangement in hand – or so I thought. …your reservation was no longer on hold. “You didn’t pick up your permits before 10am,” she said. I was dumbfounded. I had explained to her that I called yesterday evening to hold on to our permits in case we showed up after ten. 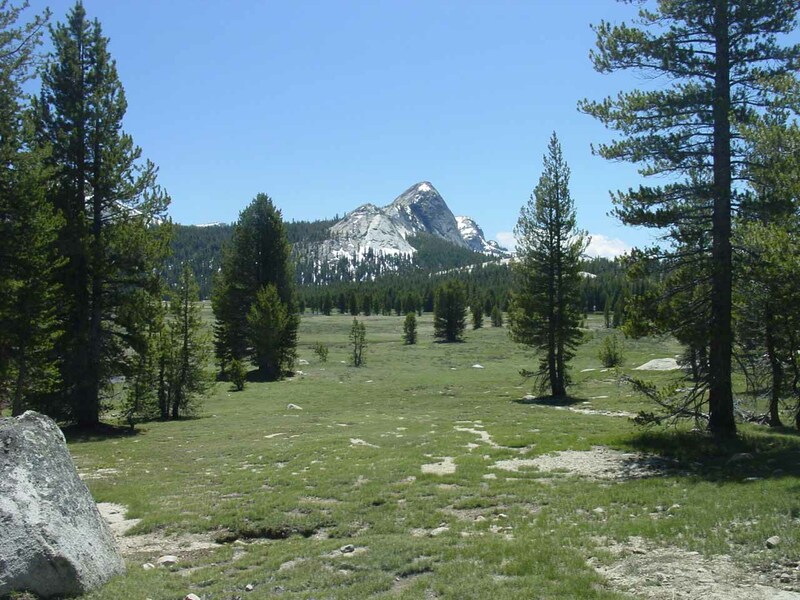 Before I was really about to get pissed off, she said they still had three permits available for the Tuolumne Meadows trailhead. Fortunately for us, those three permits were the very ones they took off the reservation list, and that no one else claimed them before we showed up. So quickly we acted on getting those permits, and we headed back out to the parking lot to repack our belongings. 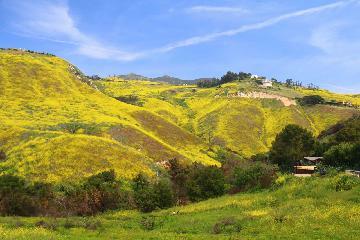 I didn’t have a plan B for the trip so I wasn’t sure what we were going to do if we couldn’t do the planned hike. 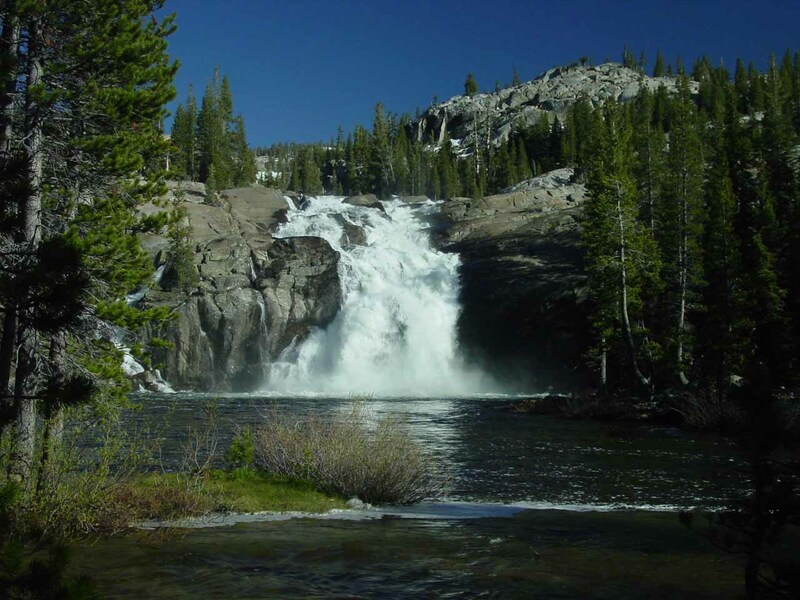 That planned hike, by the way, was the Waterwheel Falls hike with two nights of camping nearby the Glen Aulin High Sierra Camp. 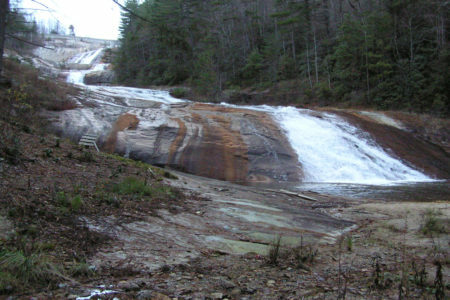 The camp’s amenities were closed as it was too early in the season so the area would retain its backcountry feel until later in the Summer when the place would be open for business. That’s fine by us since we were going after a backcountry experience anyways. 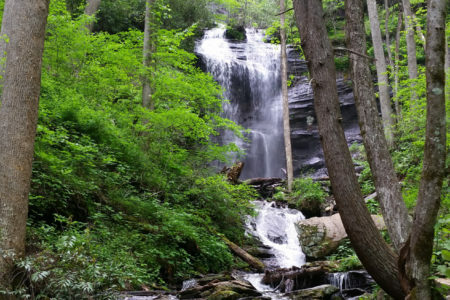 The Waterwheel Falls hike was at least 16 miles, but we were breaking it up over three days and two nights. 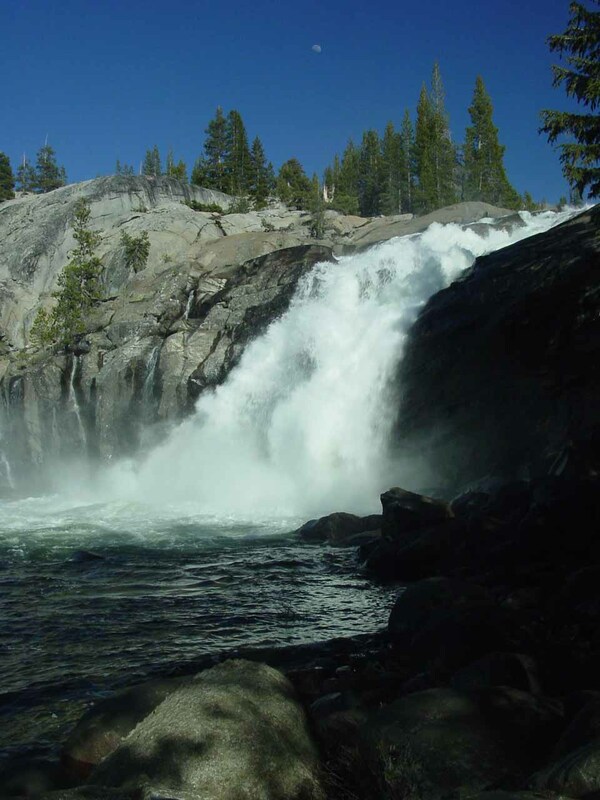 The trail would lose nearly 3000ft in elevation as we would get nearer Waterwheel Falls – which was situated pretty much where the Grand Canyon of the Tuolumne River begins. So all three of us repacked our internal frame packs – bear canisters and all – and loaded up the car again. Each pack was easily about 40-50lbs. We each split up responsibilities in terms of carrying tents, cookware, food, canisters, and clothing. A few minutes later, we made it to the unpaved road where the Glen Aulin trail began. Watched over by the slanted Lembert Dome, there were plenty of cars parked alongside the dirt road. We managed to find a spot and leave the car there. …and not too soon since the mosquitoes were starting to swarm us and look for unsuspecting blood donors. It was about 12:15pm by now and we were off. 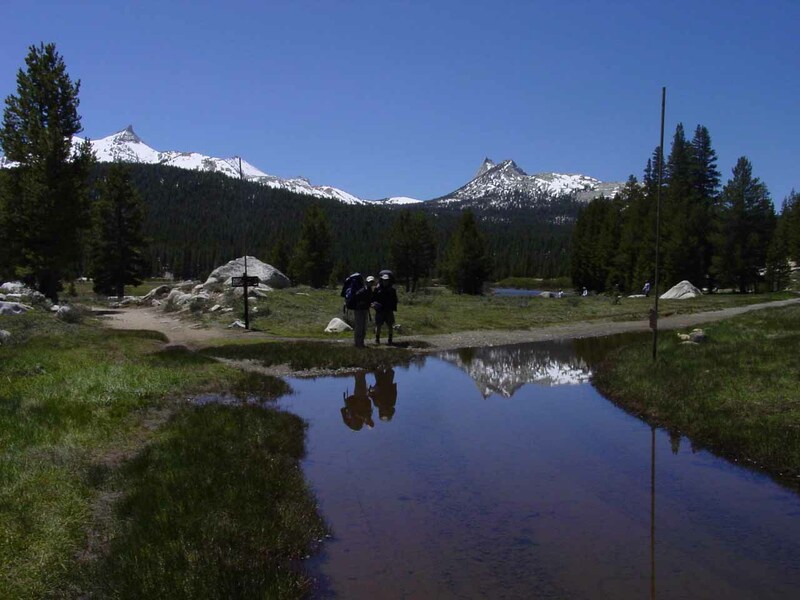 It was unusual that the Tioga Pass was open by Memorial Day, but this year had a dry Winter. Even with that said, the High Country peaks were beautifully clad with snow piercing the cloudless deep blue skies. Tuolumne Meadows was already a grassy green though there were plenty of pools of standing water – resulting from the fresh snowmelt and muddying parts of the trail. These pools were great for reflection photographs but also a haven for annoying mosquitoes. When we reached the Parson’s Memorial Lodge area, we somehow lost the way in the confusing network of trails. After about 15 minutes, we realized that we had gone the wrong way when we noticed smelly and artificial pools of waste water. So after another brief delay, we were back on the trail and found the four-way intersection between Soda Springs and Parson’s Lodge. Now the trail started to go into a more forested scene. 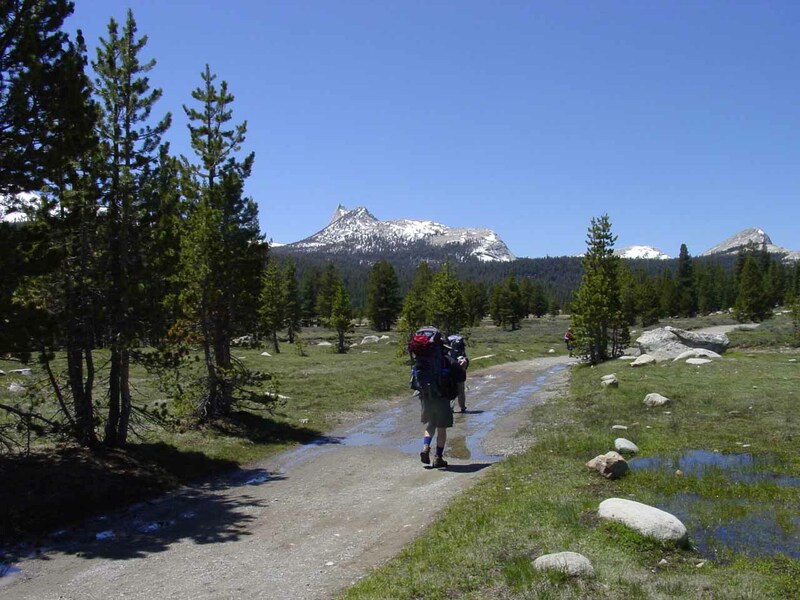 The forest was not dense though so you could see the vast grassy landscape of Tuolumne Meadows along with views of the lovely peaks such as Cathedral Peak, Unicorn Peak, and Fairview Dome. About 90 minutes since the start of the hike, we had to get across a deep creek crossing. Fortunately, there was a downed tree further upstream, but it was quite tricky balancing on the narrow tree with 50lb packs on our backs. All three of us made it through without incident. Then, the trail proceeded uneventfully until we got to an exposed granite section. Such sections don’t have trails so we had to look for stacked rocks called cairns to lead the way. 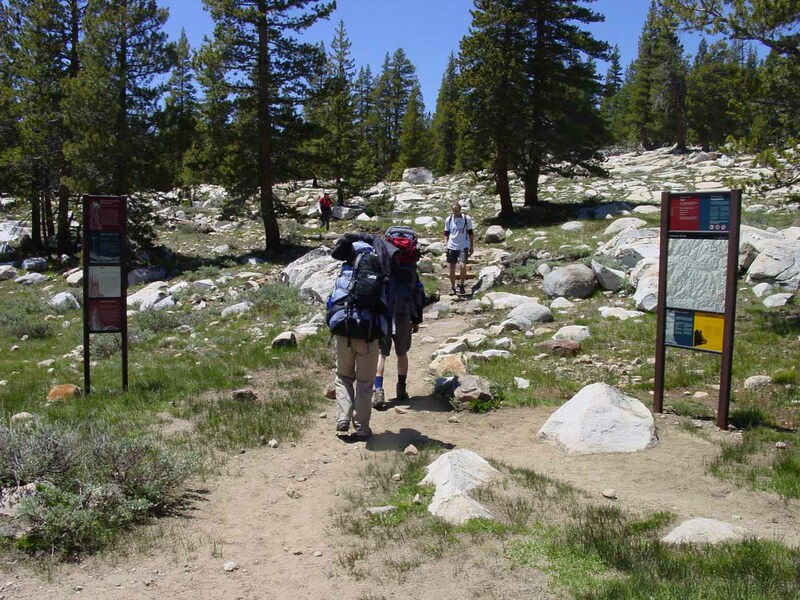 Unfortunately, there were also false cairns leading us the wrong way to the Tuolumne River. There was a nice set of rapids there, but we had to back track and find the correct cairns and trail. Once we successfully did that, we proceeded merrily until the next stream crossing. This wasn’t quite as dramatic as the first, but it was longer. With my hiking sticks and gore-tex boots, I had no problems getting across. However, both Cindy and Ed had lower shoes that didn’t have gore-tex so they were busy trying to rock hop their way without getting wet and without hiking sticks. It wasn’t long afterwards that we had to negotiate yet another stream crossing. This was much longer than the first two as an ephemeral creek spilled into some kind of delta as it added to the Tuolumne River’s flow. I ended up getting my feet wet and soggy on this crossing and I’d imagine so did Cindy and Ed. Our worries of getting soggy and pruny feet subsided as we continued to trudge onwards. It seemed like forever before we finally reached an outcrop with our first expansive views of the Glen Aulin area. As the sun continued to dip lower on the horizon, the skies became a darker blue, and even the early moon was visible in the late afternoon light. 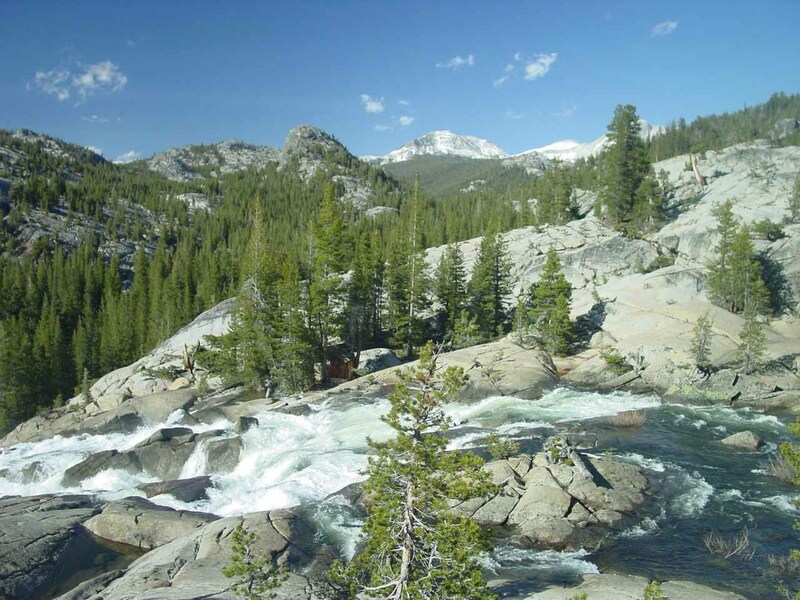 We proceeded to descend from the outcrop, through another forested area, and eventually to a set of footbridges that crossed the Tuolumne River. 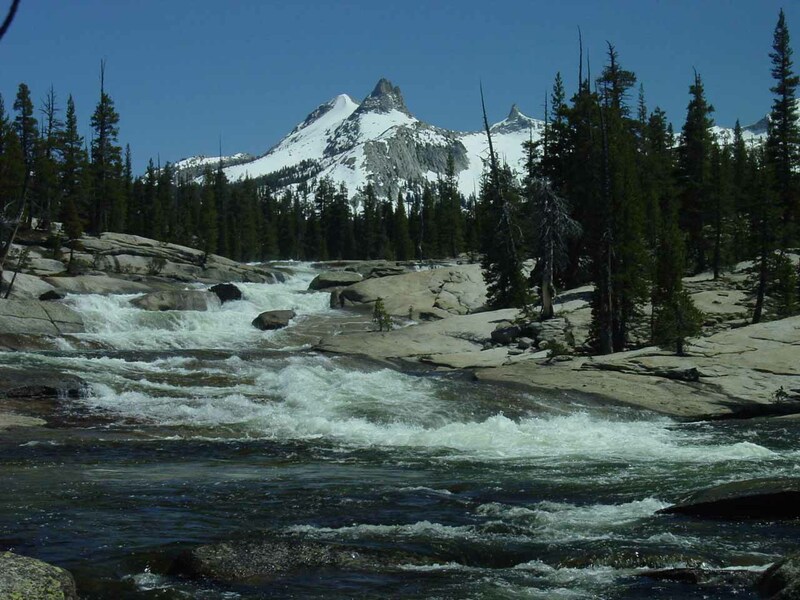 At this point, the river started to gain momentum and become a continuous series of rapids and cascades. Spurred on by the sound of refreshing sound of moving water, we started to pound our feet and legs on the unforgiving granite steps as we descended along with the river. 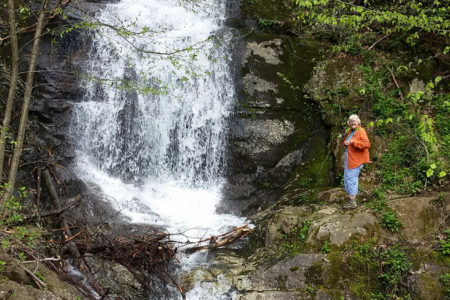 Easily distracted by some of the smaller cascades, both Ed and I took frequent photo breaks. 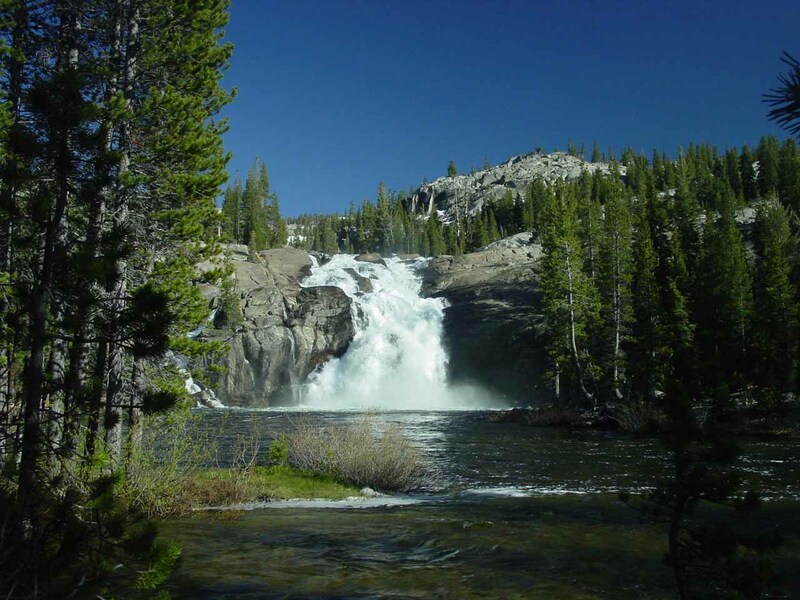 …it was Tuolumne Falls! And boy did it have a nice rainbow before it! The three of us seized this opportunity for photos. 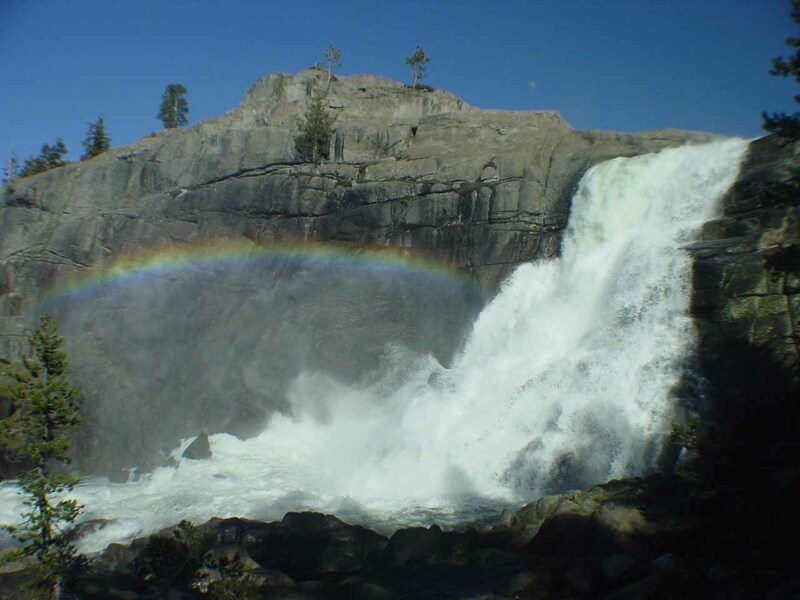 Tuolumne Falls had a satisfyingly steep drop, and to have it juxtaposed with cloudless blue skies along with a rainbow made it real difficult to keep going. Nonetheless, we eagerly continued on – sensing we were getting close to camp. The trail continued to descend down more granite steps. 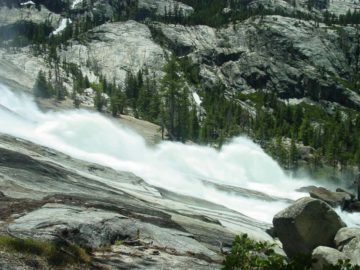 We saw that the Tuolumne River was about to make another drop, but the trail kind of veered away from the river at this time. In any case, we took more photos of the scene as we could see attractive granite peaks and domes surrounding a valley that we were about to enter. As we looked across the river, we could see that there were some shacks besides the river. We weren’t sure what they were for, but there was no way we could access them from where we were at. But the signs of civilization were certainly encouraging since it was getting late and we knew that we still had to set up camp. The trail continued to descend down more granite steps before hitting a junction. Turning right at the junction, the trail became dirt again. 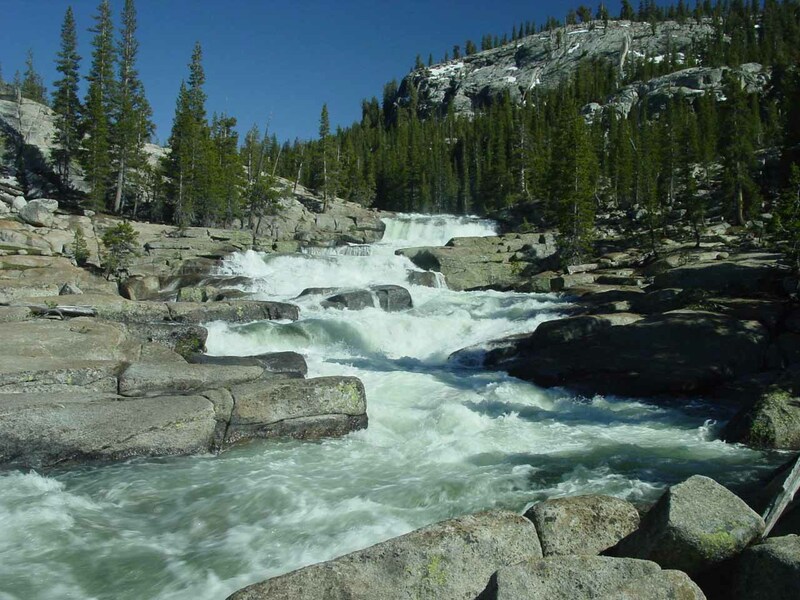 Shortly thereafter, it crossed a series of footbridges crossing the wide Tuolumne River. 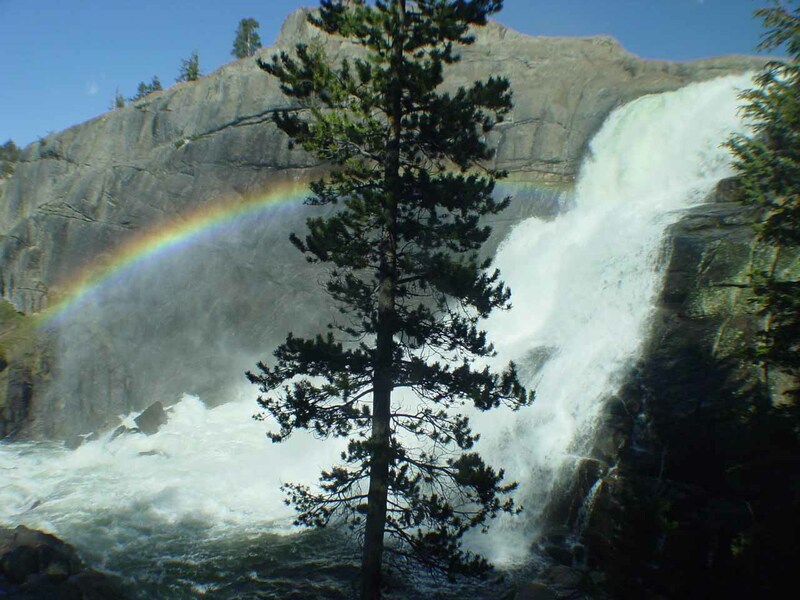 At this point, we could see the attractive White Cascade. As we spent a few minutes searching for a place to set up our base camp, we finally managed to find one atop a small ridge with a few other tents nearby. After setting everything up, Cindy and Ed quickly took out my Pocket Rocket stove and went to work preparing quesadillas, oatmeal, and pasta. 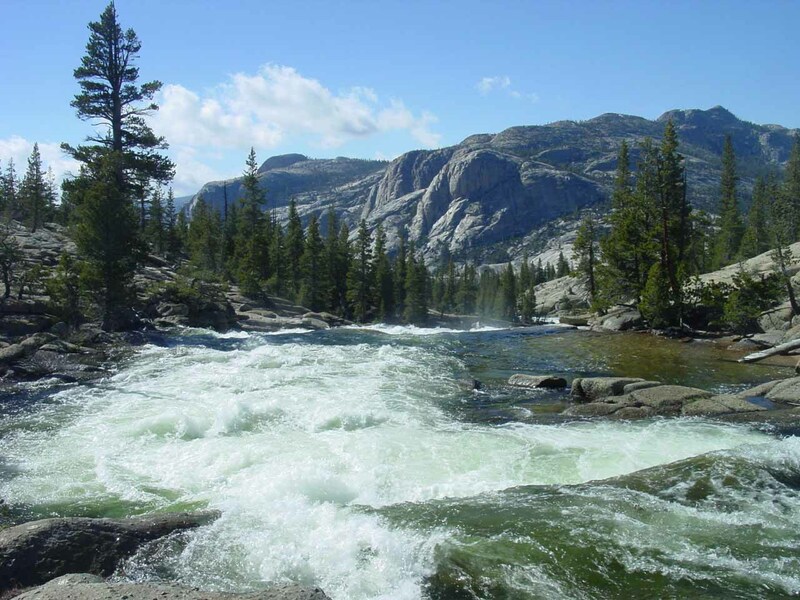 Meanwhile, I got my collapsible bucket and Waterworks II filter and replenished our water supply along the cool Tuolumne River. We enjoyed the dinner, the surroundings, and even the company of other fellow campers. It was quite a way to spend the first night out in the High Sierra backcountry. Before we could quietly brush our teeth and get to sleep, we started to hear a huge raucous of clanging pots and pans along with people screaming in unison! When the noise got louder as it was approaching us, soon other campers joined in the fray and started making noise. Down below the ridge was a big, lumbering bear. Apparently, it must be looking for some freebies as it was obvious it had already made the connection between people and food. All that noise was an effort to scare it away, but it seemed kind of immune to all the racquet and kept lumbering along. Eventually, it would head back into the woods and the raucous faded. Returning were the sound of crickets and the odd conversation here and there. It was a little unsettling knowing that we’re sleeping in the open air with a hungry bear looking for human munchies. So all of us crowded the nearby bear lockers with our packs and made sure the locked bear canisters were several steps away from our tents. Other than that bit of drama, all of us spent the night in relative camp comfort – all under a starry night and a very bright moon.